Having the right items and tools with you at the Shooting range can save you from many frustrating experiences. When we go to the range we always take lots of gear. Some big – like our rifles and some small – like loaders. To make sure that we can store it all in one place and keep it all together at the range we wanted a range bag that was big enough without being huge. 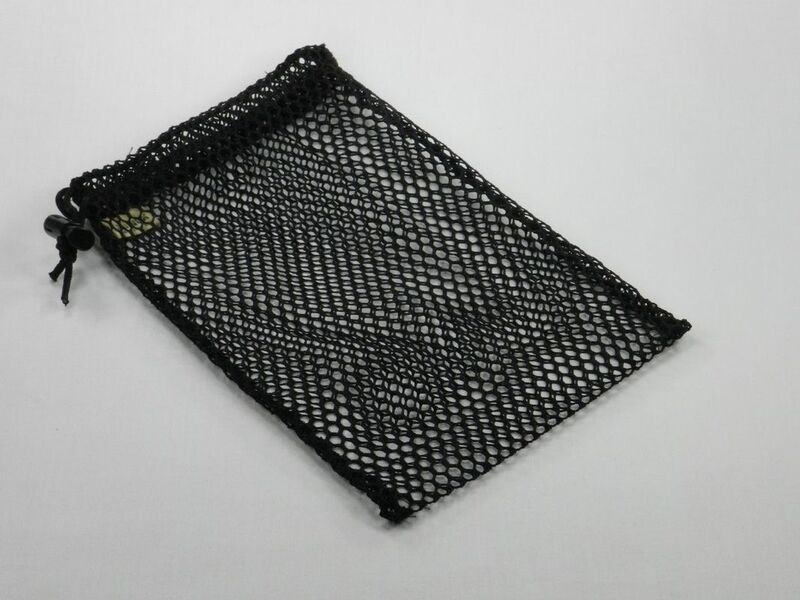 The criteria that we use to evaluate range bags are: 1) size, 2) number of pockets and dividers to store item, 3) easy of carry, 4) material, 5) quality and 4) price. To keep it all together at the range we use a Blackhawk! Sportster Pistol Range Bag. The bag is made from 600 Denier Polyester, measures 16" x 8" x 9" inches and weighs 1.9 pounds. It has two zippered exterior pockets to hold magazines and other small items, a set of handles and a shoulder strap. The center compartment opens up with two zippers connected with a nylon strap which makes it easy to pull both zippers open simultaneously. Inside the center compartment there are two removable Velcro dividers. This bag feels much larger than it looks; and it really does the job. We keep our ear muffs, shooting glasses and anti-fog spray in one or the internal divisions. In the other we keep our tools and loaders. There is also room inside for our small tripod. In the outside pockets we keep our notebooks and other flat items. You can buy this range bag at Amazon. So that we can write notes about our shooting activities we keep a small notebook in our range bag. Since we shoot outdoors quite a bit we needed a notebook that was at least water resistant. The criteria that we use to evaluate waterproof notebooks are: 1) size, 2) water resistance and 3) price. To meet our needs we bought a Rite in the Rain All-Weather Memo Book. The notebook has 100 pages (50 sheets) of light grey waterproof paper. Pencils, ballpoints, felt-tipped markers and Space pens all work well on the paper. 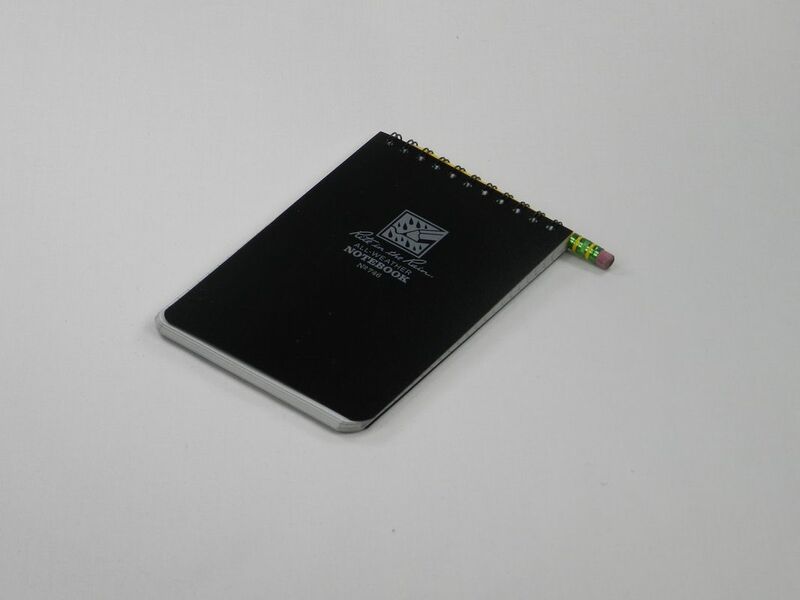 For us, this little 4” x 6” notebook was the perfect solution. You can buy this waterproof notepad at Amazon. In addition to our small shooting tripod there are occasions where we use shooting bags for sighting-in or accuracy improvement. 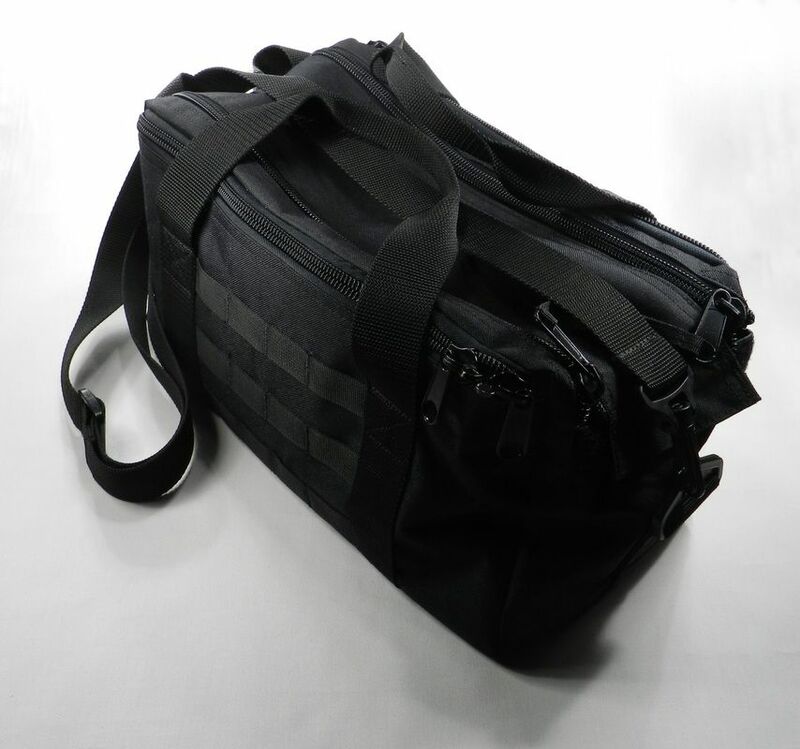 The criteria that we use to evaluate shooting bags are: 1) size, 2) durability, 3) flexibility and 4) price. 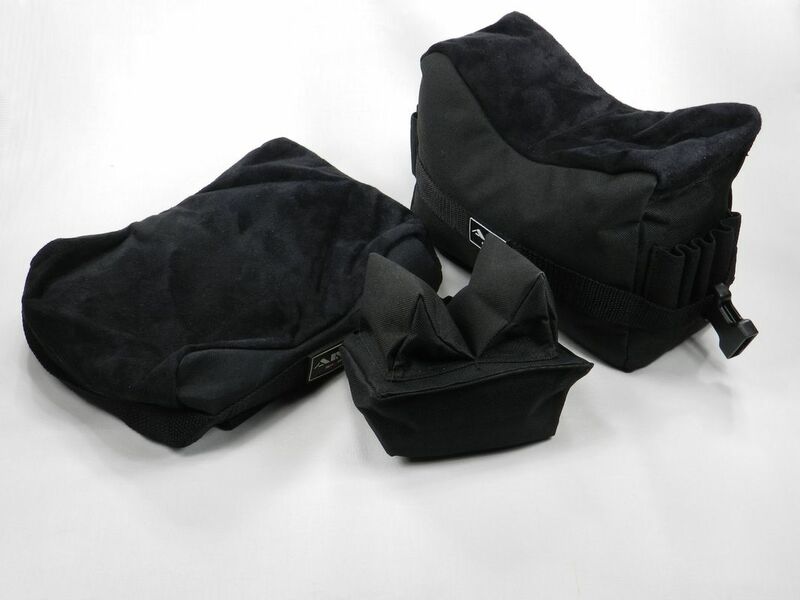 We use the Aim Sports Set of 3 Black Bench Rest Shooting Bags. There are three bags in different sizes for different purposes. The bags are made from water resistant 600 Denier polyester and need to be filled with dry silica, pea gravel, sand, rice, ground corn cob (our choice) or other similar fillers prior to use. The combined weight of all three bags when filled is approximately 10 lbs (depending on what you fill them with). Each bag has a velcro closure that folds over fill hole to keep the material securely inside. The two larger bags have a suede cover. 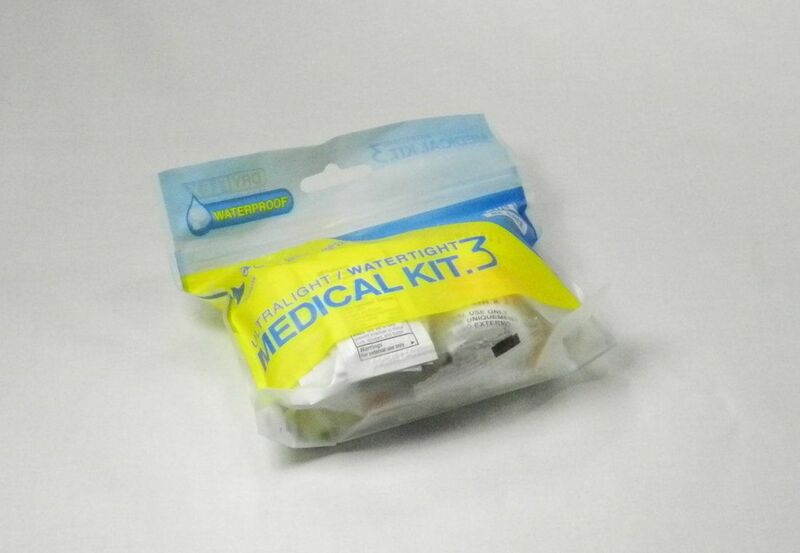 These bags are well made and come in handy since they can be configured in many different ways. You can buy these shooting bags at Amazon. To fill our Aim Sports Shooting Bags we looked at the various options to include dry silica, pea gravel, sand, rice, and ground corn cob. The criteria that we use to evaluate filler for shooting bags are: 1) weight, 2) stability, 3) noise, 4) impact of getting wet, possibility of leakage, and 5) price. 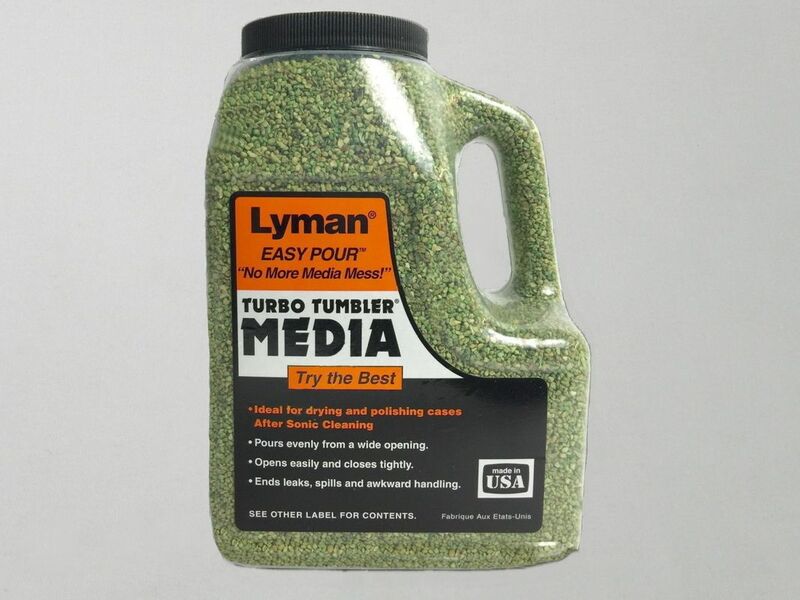 After examining the options we decided to use Lyman Turbo Treated Corncob Case Cleaning Media since it will not leak like sand, is finer than pea gravel, is not a food like rice and will dry out if it gets wet. You can buy this corn cob filler at Amazon. When you shoot from a prone position on that hard range concrete quickly find out that you really need to have a shooting mat. The criteria that we use to evaluate shooting mats are: 1) rolled out size, 2) thickness of mat, 3) comfort, 4) durability, 5) weight, 6) rolled up size, and 7) price. Since the quality and price of shooting mats are all over the place we went with one we had seen other people using at the range; the MidwayUSA Pro Series Competition Shooting Mat. 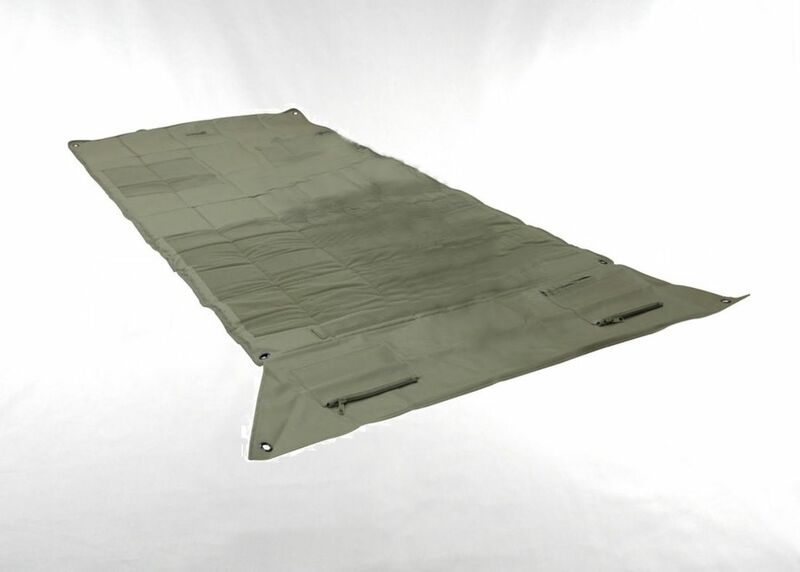 This mat made of 400D PVC Coated Polyester and measures 8-½" x 35-½" when rolled up. It expands to 73½" x 35½" when rolled out (excluding the length of the 12" front flap). The mat weighs 6.5 lbs, has elbow and knee pads, and is .535" thick at the elbow and knee pads, .525" thick everywhere else. It also has a 23 1/2" x 2" bipod pre-load webbing, 4 staking grommets and a shoulder strap. You can buy this shooting mat at midwayusa.com, just be aware that it goes on sale fairly regularly and you can save a significant amount off of the list price when it is on sale. If we are shooting at the indoor range , or outdoors at 25yards or less we find that we don’t need any help seeing the targets for assessing where our shots hit. But when we are shooting at distances further than 25 yards, especially with .22 caliber rounds, we need to use a set of binoculars. The criteria that we use to evaluate large binoculars are: 1) maximum magnification, 2) fine adjustability, 3) size, 4) weight and 5) price. When we need binoculars we take our Nikon Action 10 x 50 - 6 Degree Lookout II binoculars; the same binoculars that we take camping on occasion. 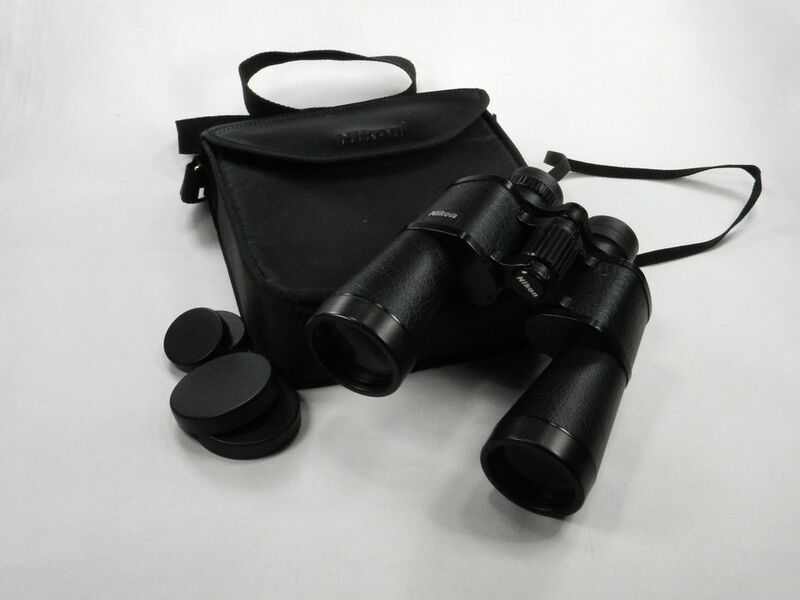 These binoculars have 50mm objective lenses, measure 4.2” x 8.4” x 9.6” and weigh 2 ¾ lbs. They are great for allowing us to see what we hit on the 60 and 100 yard targets. Although you can no longer buy these specific binoculars, you can buy the current version of these binoculars at Amazon. On some occasions it makes sense to wear gloves while shooting. 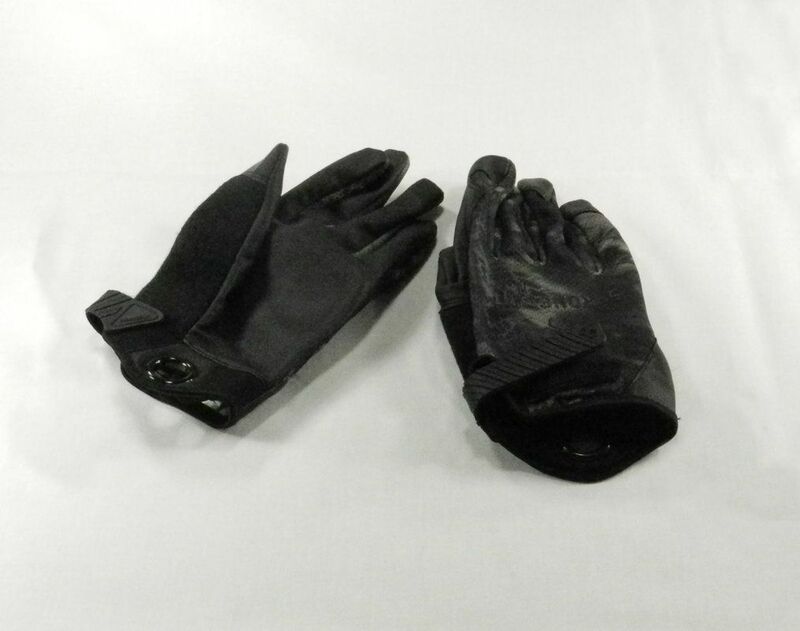 For us the problem has always been finding a pair of gloves that protect your hands and provide a good grip – while not getting in the way of performing the manual functions required by loading and shooting a firearm. The criteria that we use to evaluate shooting gloves are: 1) tightness of fit to your hands, 2) comfort on your hands, 3) quality of manufacture and 4) price. Let’s face it, buying gloves that you have never personally tried on from an internet retailer is a dicey thing to do since the fit and feel is so specific to you individually. At the Great American Outdoor Show we saw some StrongSuit Q-Series Enforcer TAC gloves that looked like they would meet our needs since they were made in partnership with Gary Quesenberry, a professional firearms instructor, competitive shooter and Top Shot All-Star finalist. 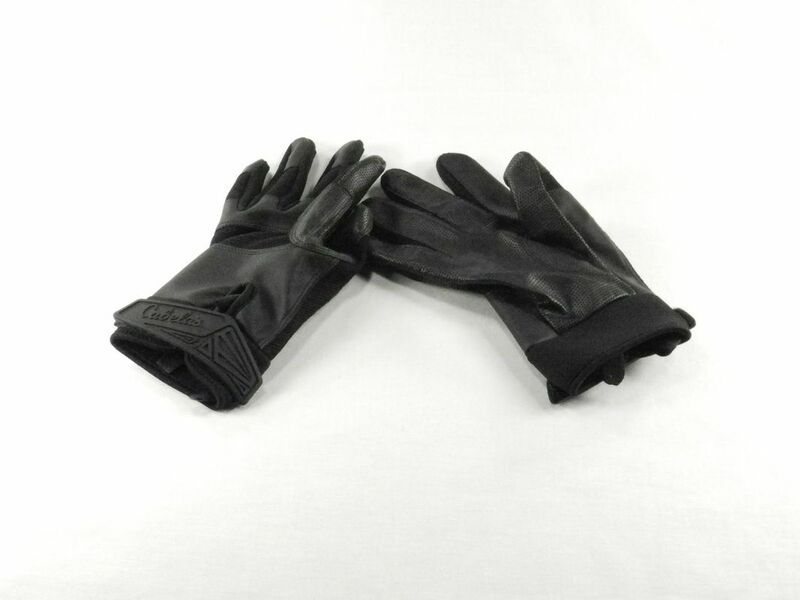 The back of the gloves are made out of a breathable fabric that keeps your hand cool. The palm of the gloves are made out of a “TAC-Sense” material that combines good grip with form-fitted pre-curved fingers for a tight fit and feel. The gloves have a Velcro closure wrist, terry cloth sweat wipe, and carabiner clip ring for secure storage. You can buy these gloves at Amazon. When the weather turns cold having a good pair of shooting gloves is critical. The problem is always balancing the warmth that the gloves provide with the need to still be able to have enough tactile feel to load and fire your weapons. The criteria that we use to evaluate cold weather shooting gloves are: 1) tightness of fit to your hands, 2) comfort on your hands, 3) warmth, 4) wind resistance, 5) quality of manufacture and 6) price. Since we highly value the ability of the gloves to allow you to operate the firearm, we prefer gloves that fit well while providing good wind resistance and sufficient warmth, over bulky gloves that hinder our activities. Because of this we bought a pair of Cabela’s Active Lite Shooting Gloves. The stretchy fabric on the back of the gloves makes them fit tightly – but comfortably, even when wearing them for an extended period of time. The textured leather palms have reinforced patches in high-wear areas and provide good dexterity and tactile feel that gives you a sure grip on the firearm and good trigger control. The only thing that I did not like about the gloves was that Cabela’s branded them in bright yellow on the wrist straps – which you see all the time. To fix this I just used a black Sharpie marker to color over the branding. You can buy these shooting gloves at Cabela’s. To put or targets on the target stand (whatever that might be for you) you need a way to attach the targets. We find that a staple gun works the best. 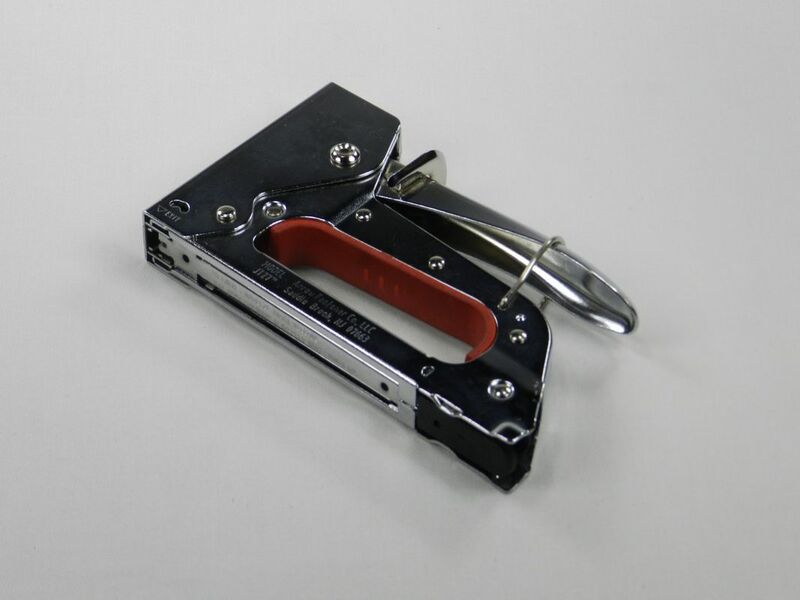 The criteria that we use to evaluate staple guns are: 1) size, 2) weight and 3) price. Since you are not doing home improvement this staple gin needs to be small, light and reliable. 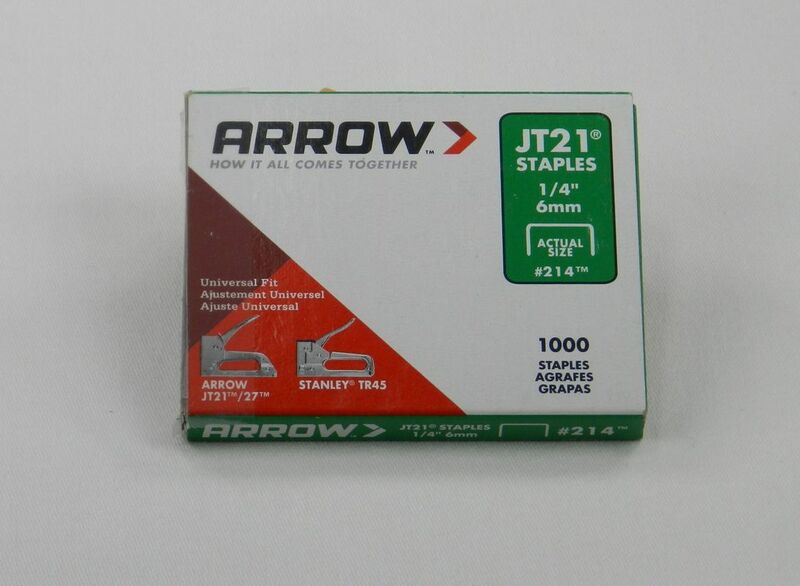 We use an Arrow Fastener Manual Staple Gun (JT27) with ¼” staples. It seems to do the trick. You can buy this staple gun at Amazon or your local hardware store. Inevitably you will run out of the staples that come with the staple gun so you will need additional staples. The criteria that we use to evaluate staples are: 1) do they fit the staple gun, 2) length and 3) price. Rather than ask for problems we use exactly the same kind of staples that came with the staple gun originally - Arrow 1/4" JT21 #214 Staples. We find that using staples longer than ¼” in length doesn’t hold the target any better, but makes it harder to get the staples out. You can buy these staples at Amazon or your local hardware store. When we shoot we often shoot a group and then check to see how we did. To differentiate these shots from the next group of shots we make tic marks on our target with colored markers. The criteria that we use to evaluate colored markers are: 1) number of colors, 2) ability to write on all types of targets, 3) lifespan and 4) price. At home we use Sharpie Fine Point Markers for all sorts of things, so we use them at the range too. We normally take red, green and blue markers with us so that we can easily differentiate different groups. 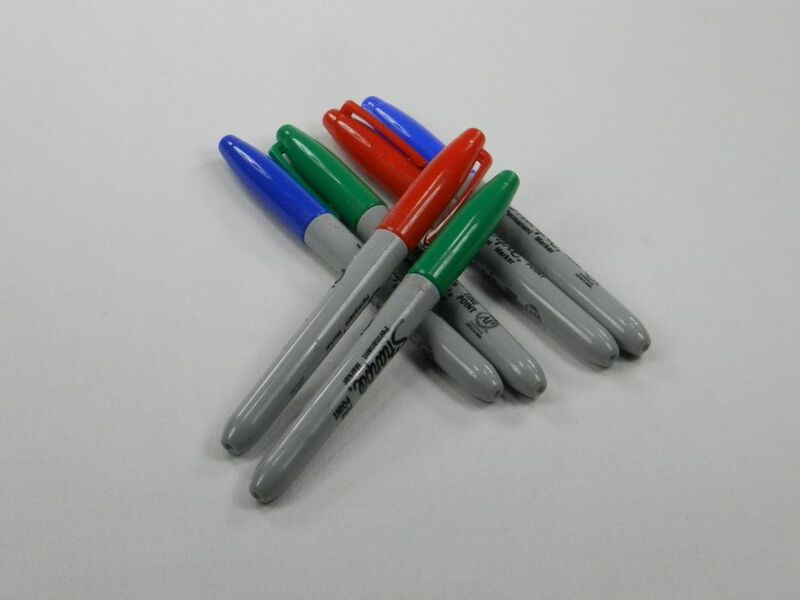 You can buy these colored markers at Amazon or our local office supply store. ​One of the things that we see quite a bit at the range is people having issues with their optics. Sometimes it’s related to the scope or red dot sight mount becoming loose. But more often than not it has to do with dead batteries in their optics. The problem seems to have two components: 1) the current battery in the optics dies and 2) the person with the dead optics failed to bring a spare battery in case they needed it. Because of this we always make sure that we have extra batteries for our sights in our range bag. Based on the optics that we have we bring three extra types of batteries: AG5 (309/393) for our Kriss Vector’s Sightmark SM14000, a 3 volt CR2 for our Sightmark SM26005 (Stag 9 and S&W 15-22) and a AA battery for our CZ Scorpion’s Sightmark Wolverine CSR Red Dot SM26021. Since extra batteries aren’t that big or heavy, and not having a spare battery when you need it can be a real pain, we recommend that you throw the backups that you might need into your range bag before you head out the next time. You’ll be glad that you did if your current battery dies. 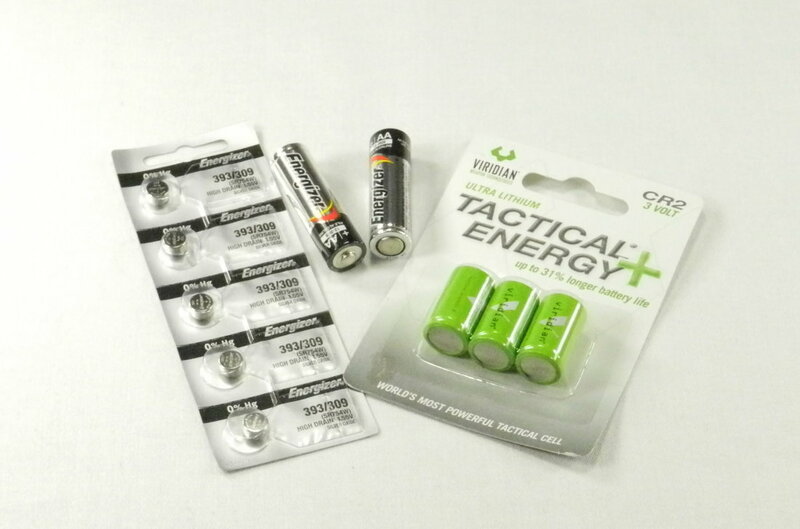 You can buy these batteries at Amazon here (AG5 – Energizer 393/309), here (Energizer AA Max Alkaline) and here (CR2 - Viridian CR2 3v Lithium Battery). I can’t count the number of times we have been at the range when we, or someone shooting near us, needs a tool to make some adjustment to their firearm or to clear a misfeed or failed extraction. Because of this we keep a small tool kit in our range bag. The criteria that we use to evaluate small tool kits are: 1) number of tools, 2) types of tools, 3) quality of tools, 4) size of toolkit, 5) method of storing the tools together, and 6) price. Once again, there is no need for overkill here, so we keep an Allied Tools 49032 25-Piece Tri-Fold Mini Tool Set in our range bag. The toolkit measures 4.2" x 6.5" x 2.1" and weighs 1.1 lbs. 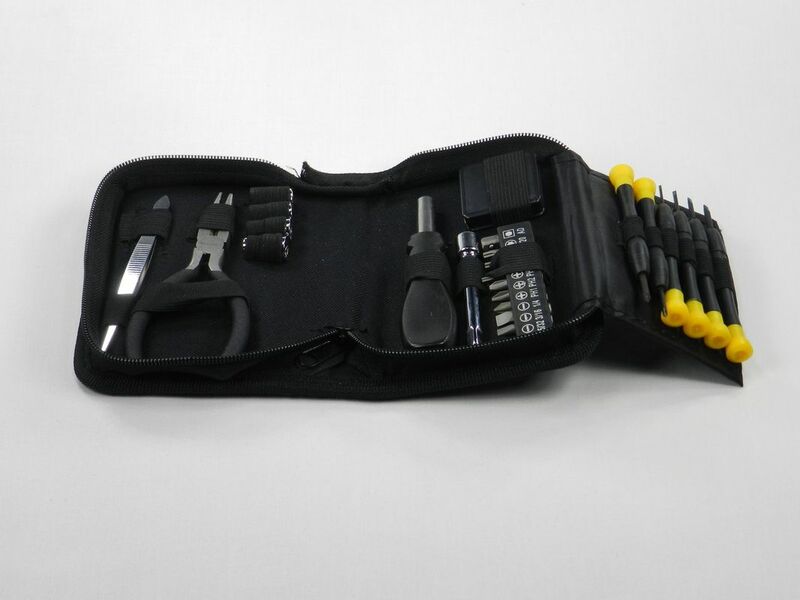 It comes in a tri-fold zippered case and includes long nose pliers, long reach tweezers, a 3' tape measure, 6 precision screwdrivers, a driver with 9 screwdriver bits and 4 sockets, a socket adapter and a socket extension. You can buy small tool kit at Amazon or your local hardware store. Even though we carry a small toolkit we sometimes find that there are even smaller screws that need to be turned. So we also have a precision screwdriver set. 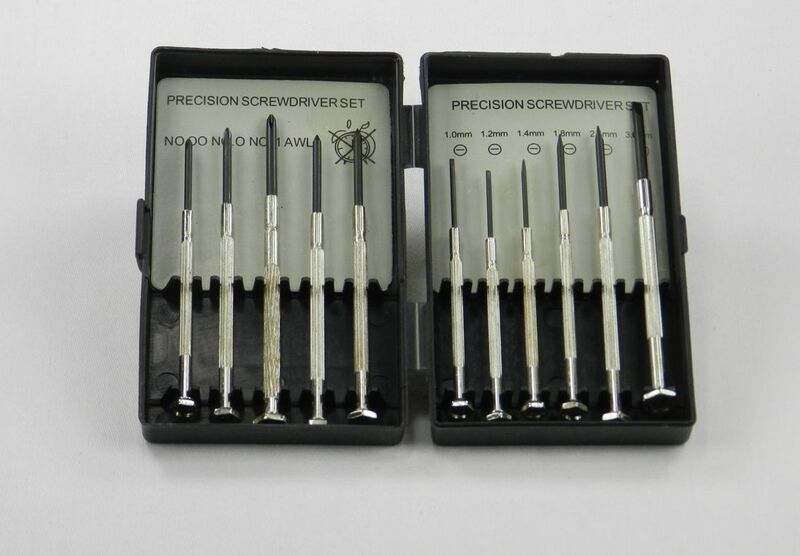 The criteria that we use to evaluate precision screw driver sets are: 1) number of screwdrivers, 2) size of screwdrivers, 3) strength of screwdrivers, and 4) price. For these tools we have a "Precision Screwdriver Set, for Eyeglass, Watch Clock, Jewelry Repair–11 pieces". 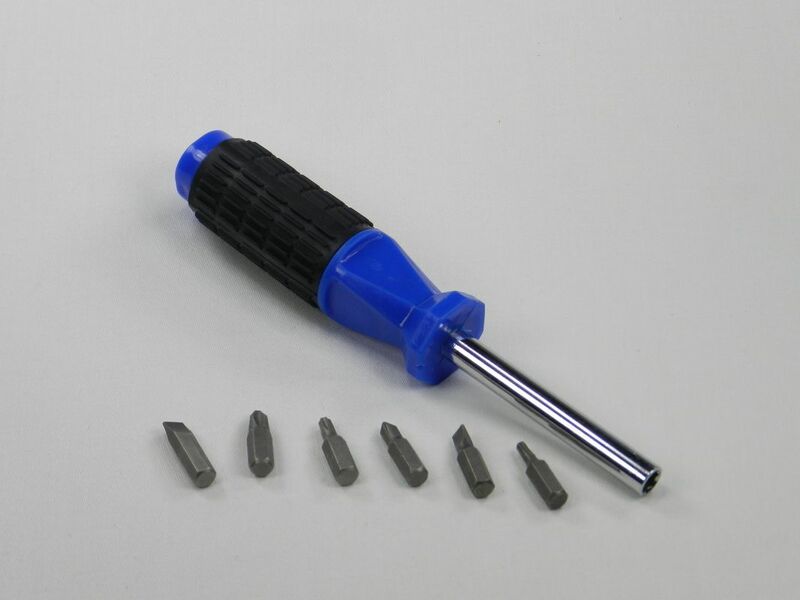 The screwdriver set comes in a small plastic case and has slotted sizes: 1.0, 1.2, 1.4, 1.8, 2.4, 3.0mm; Phillips sizes: 00, 0, 1; and an magnetic awl tip. You can buy this screwdriver set at Amazon or your local hardware store. Sometimes we need more power than precision so we also carry a larger screwdriver. The criteria that we use to evaluate multi-blade screwdrivers are: 1) size, 2) number of blades, 3) type of blades, 4) weight, 5) blade storage method and 6) price. This screwdriver comes with six bits that can all be stored in the handle. The screwdriver measures 7.9" x 2.7" x 0.8" and weighs 4 oz. Although this in not a high precision tool, the fact that it is flexible, compact and the size of a normal screwdriver makes is great for what we find we need at the range. You can buy this screwdriver at Amazon or your local hardware store. Many firearms don’t just have screws heads, they have hex heads too. So for that you need a specific hex key. The criteria that we use to evaluate English hex wrenches are: 1) sizes of hex keys, 2) number of hex keys, 3) strength, 4) usability and 5) price. 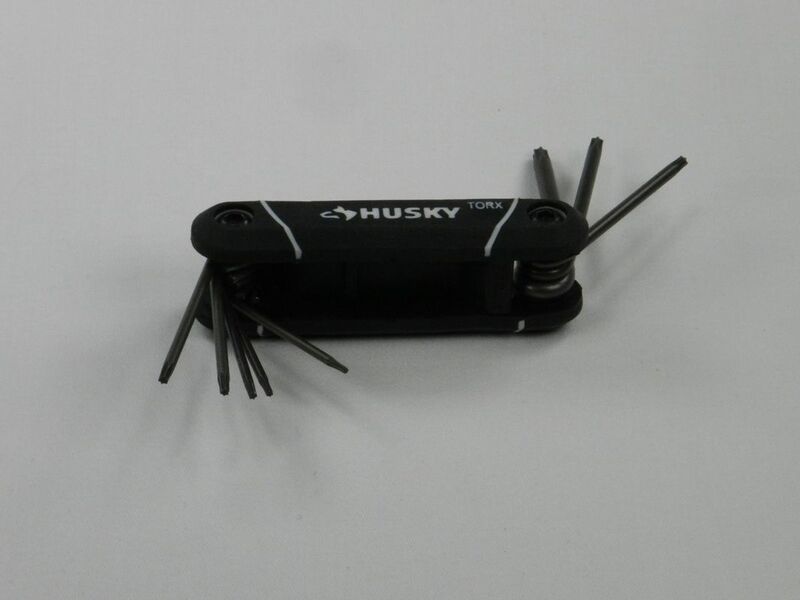 We keep the Husky SAE Folding Hex Key Set in our range bag. It comes with the following SAE hex keys: ¼”, 7/32”, 3/16”, 5/32”, 9/64”, 1/8”, 7/64”, 3/32”, 5/64”. The wrench measures 4.2" x 1" x 1.2" inches and weighs approximately 6 oz. You can buy this SAE hex set at Amazon or your local hardware store. Since most forearms that were manufactured by companies outside the United States use the metric system in addition to an SAE Hex Wrench you need a metric hex wrench. The criteria that we use to evaluate Metric hex wrenches are: 1) sizes of hex keys, 2) number of hex keys, 3) strength, 4) usability and 5) price. 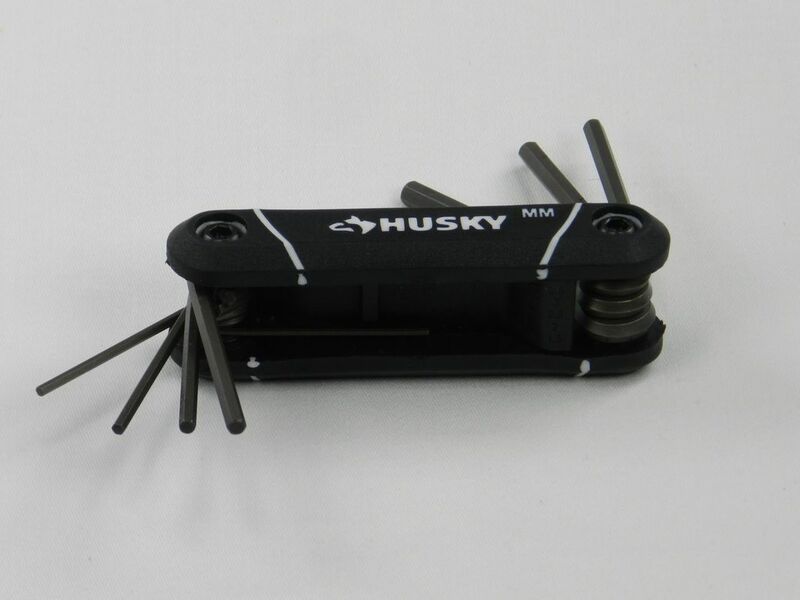 We keep the Husky Metric Folding Hex Key Set in our range bag. It comes with the following SAE hex keys: 8 mm, 6 mm, 5 mm, 4 mm, 3 mm, 2.5 mm, 2 mm, 1.5 mm. The wrench measures 4.2" x 1" x 1.2" inches and weighs approximately 6 oz. You can buy this metric hex set at Amazon or your local hardware store. To complicate matters even more, recently some manufacturers have started using Torx (Star) heads too. So you need a wrench that fits them too. The criteria that we use to evaluate Torx wrenches are: 1) sizes of hex keys, 2) number of hex keys, 3) strength, 4) usability and 5) price. 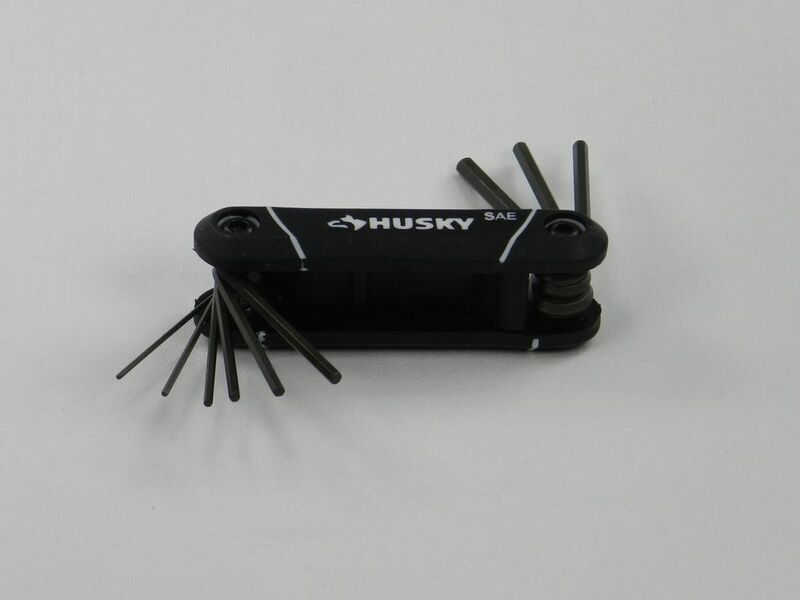 We keep the Husky Torx Mini Foldout Hex Key Set in our range bag. It comes with the following SAE hex keys: T-40, T-30, T-27, T-25, T-20, T-15, T-10, T-9”. The wrench measures 4.2" x 1" x 1.2" inches and weighs approximately 6 oz. You can buy this Torx wrench set at Amazon or your local hardware store. If you work on your firearms (to either clean, modify or enhance them) then you need the right tools for the job. Luckily most of the tools that you need are common everyday tools like screwdrivers, punches, Allen wrenches and small mallets. But if you work on an AR-15/M4 platform there is probably one unique tool that you should have – an Armorer’s Wrench. The criteria that we use to evaluate Armorer’s wrenches are: 1) functions that the wrench can perform, 2) strength of the wrench, 3) feel of the wrench in your hand, 4) manufacturing quality of the wrench and 5) price. When we looked for an AR wrench there are all types of them on the market for sale; many of them for ~$20.00 and some with random hooks and other fittings that are of questionable use. The one wrench that stood out from all the others was the Magpul wrench. Initially it stands out because, at ~$80.00, it is significantly more expensive than all of the others. So, for us, the tradeoff really became the functionality/quality of the wrench versus the price. As we looked at the other wrenches (both in person and online) we saw that most of them were made of a single piece of pressed metal that would bend when torqued. We also found that many of them were too thin to feel comfortable in your hand during use. In fact, some of them felt downright dangerous to use because of the hooks and other protrusions on the wrench. So ultimately we bit the bullet and bought what is probably the sturdiest and most expensive Armorer’s wrench on the market; the Magpul. The wrench is made from heat-treated steel and has grip-enhancing phosphate finish. It engages both stock and pin-style barrel nuts, fits standard sized 3/4" flash hiders/muzzle brakes, installs and removes rifle receiver extensions and USGI castle nuts - with extended teeth for use with ASAP plates. The wrench also has two small hammer faces, is made to work with a 1/2 “ torque wrench/breaker bar and even has the relevant torque specifications printed on the wrench for quick reference. There’s also a bottle opener for that fits both metric and SAE bottle caps (we’ve even see YouTube a video proving this). The wrench is heavy weighing in at 1.1 lbs. It is 11.7 inches long and .35 inches thick. NOTE: The wrench is made for AR-15s and M4s and is not compatible with larger pistol-style receiver extension tubes. 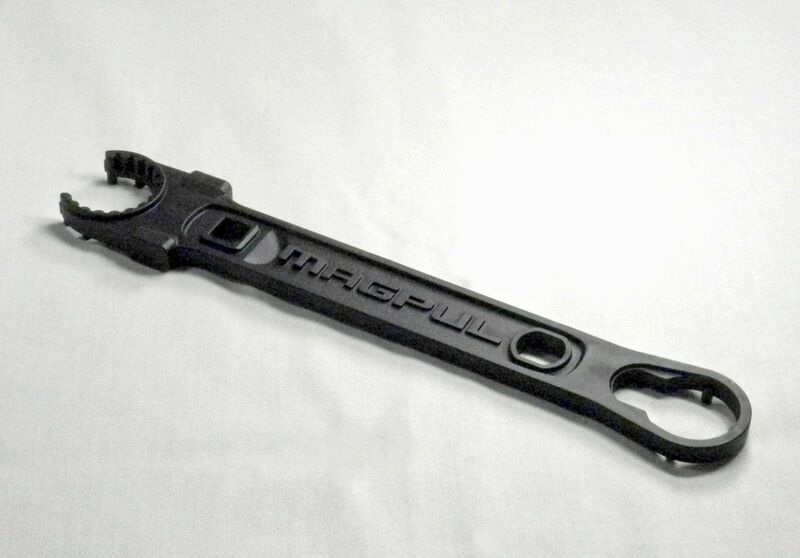 You can buy the Magpul Armor’s Wrench at Amazon. If you are like me, when you only have a few applications that need a specific tool you either make do with the tools that you have or borrow it from a friend. Once you find that you need a specific tool more frequently you eventually breakdown and buy it. That's how it has been for me and punches. With all of the various roll pins that firearms have these days I finally broke down and looked for a punch set. The criteria that we use to evaluate punches are: 1) number of punches, 2) length of punch shaft, 3) construction material of punch, 4) quality of the punch, 5) method of storing the punches together, 6) size of punch set, and 7) price. Since I wanted a strong set of punches, but didn't need a complete gunsmithing punch set because of the tools that I already have and the size of a "complete" set, I looked at punches that I could use on my firearms and for other applications. 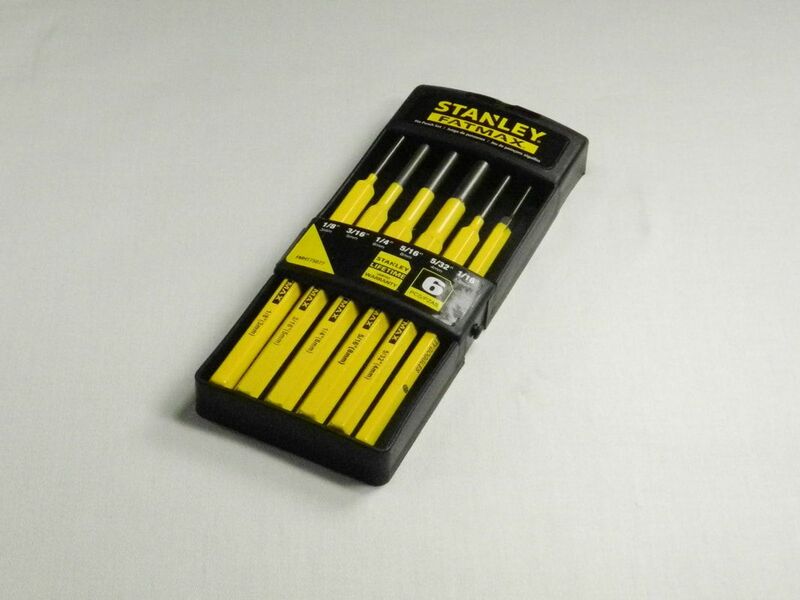 Ultimately I purchased a Stanley FatMax 6 piece Punch Set (FMHT75077). The Stanley punches are forged from one-piece tempered tool steel for strength, and are hardened and tempered for long life. 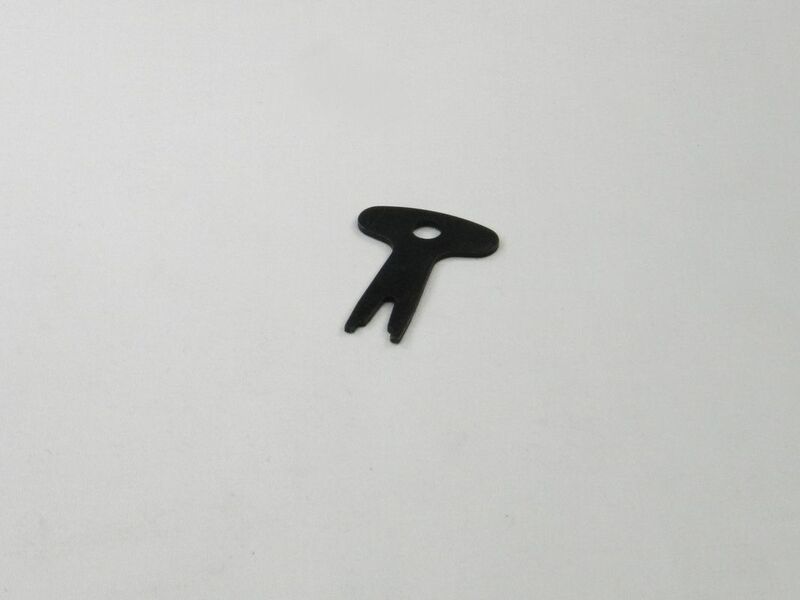 The punches also have a powder coat for increased visibility that makes them easy to find and identify the size. The set includes 6 punches in the following sizes: 1/16-Inch, 5/32-Inch, 5/16-Inch, 1/4-Inch, 3/16-Inch, and 1/8-Inch punches. The entire punch set measures 7.8" x 3" x 0.9" and weighs 14.4 ounces. You can buy this punch set at Amazon or your local hardware store. ​The Uzi requires a unique sight adjustment tool so we have one of those too. You can buy this sight adjustment tool at uziparts.com. Like the Uzi the HK rear diopter sights require a unique sight adjustment tool. 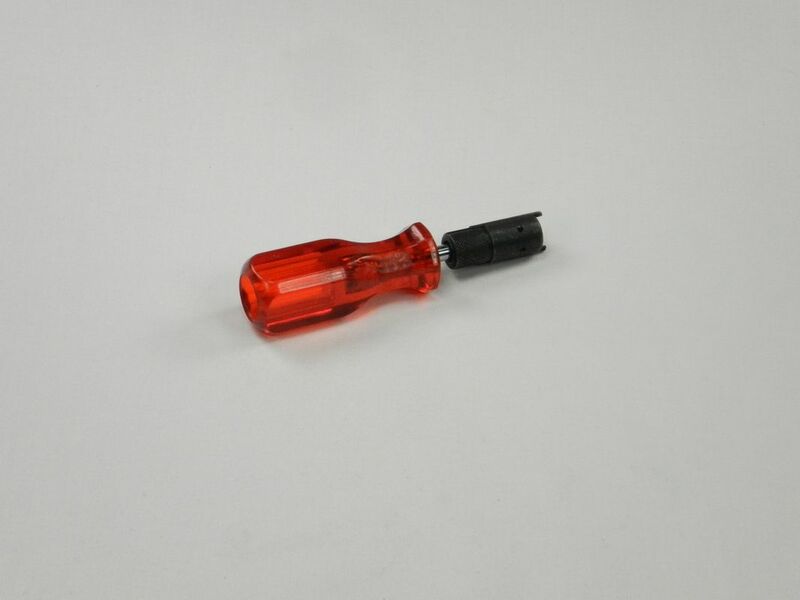 You can buy this sight adjustment tool at HKparts.net. While we are at the range we sometimes find that we need to oil a part of our firearm. Rather than carry a can of gun oil we prefer to carry gun oil wipes. The criteria that we use to evaluate individually packages firearm oil wipes are: 1) ability to get it where we need it, 2) amount of cleaning assistance provided, 3) amount of lubrication provided and 4) price. 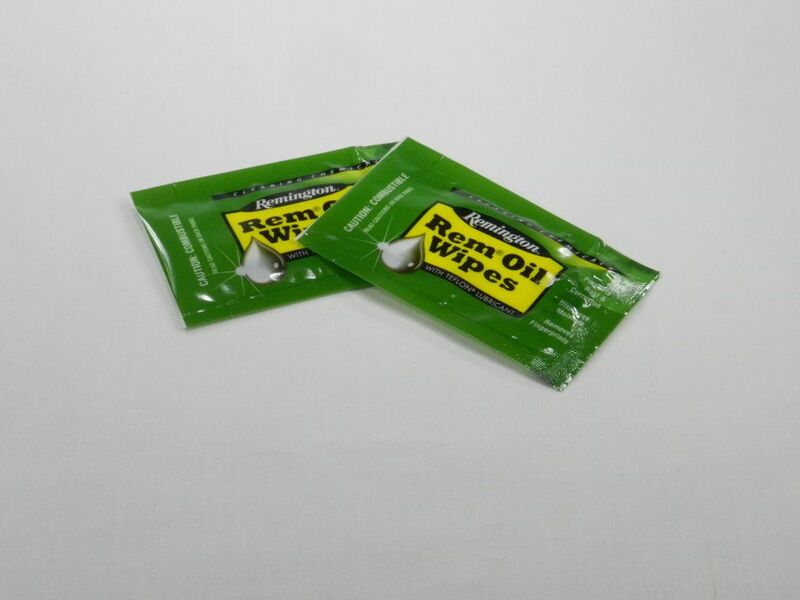 To keep the mess to a minimum, but to make sure that we have the oil we need we carry Individually Packaged Remington Rem Oil Wipes. They are just like 6” x 8” wetnaps, but have oil on them instead of hand sanitizing solution. You can buy these wipes at Amazon or your local gun store. Although we don’t use it a lot, there are times when the sun is setting, or when we need to more closely examine the inner workings of a firearm, and having a small flashlight comes in handy at the range. The criteria that we use to evaluate flashlights are: 1) maximum brightness, 2) size, 3) ease of use, 4) toughness and 4) price. 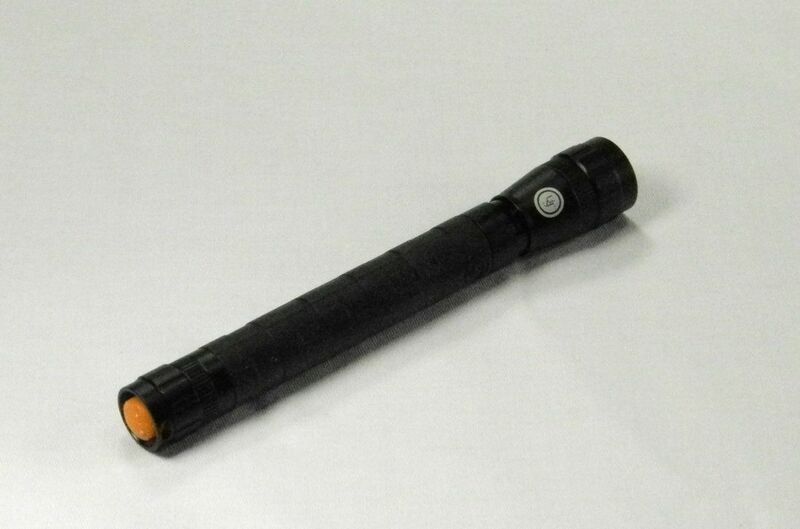 The UST flashlight is made from aircraft-grade Anodized aluminum, with a non-slip silicone sleeve around the handle. The light is impact resistant and has an unbreakable LED that provides 140 lumens of white light. 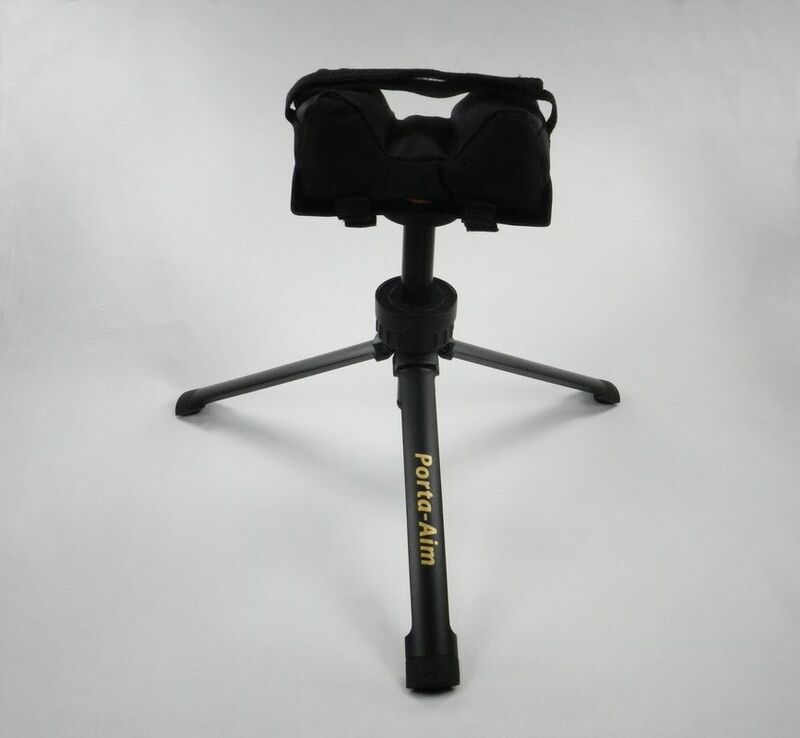 The adjustable lens allows you to focus the light beam from wide to narrow illumination. The flashlight runs on 2 AAA batteries and has three modes that can be accessed from the tailcap on/off switch at the bottom of the handle – High (140 lumens), Low (30 lumens) and SOS (140 lumens). The flashlight is waterproof and submersible in 1 meter of water for up to 30 minutes (IPX-7) and is 5.51" long, 0.75" and weighs 2.2 oz. You can buy this flashlight at Amazon. After handling our firearms at the range, and sometimes adjusting them at the range, we find that we need a good cloth rag to clean everything up. 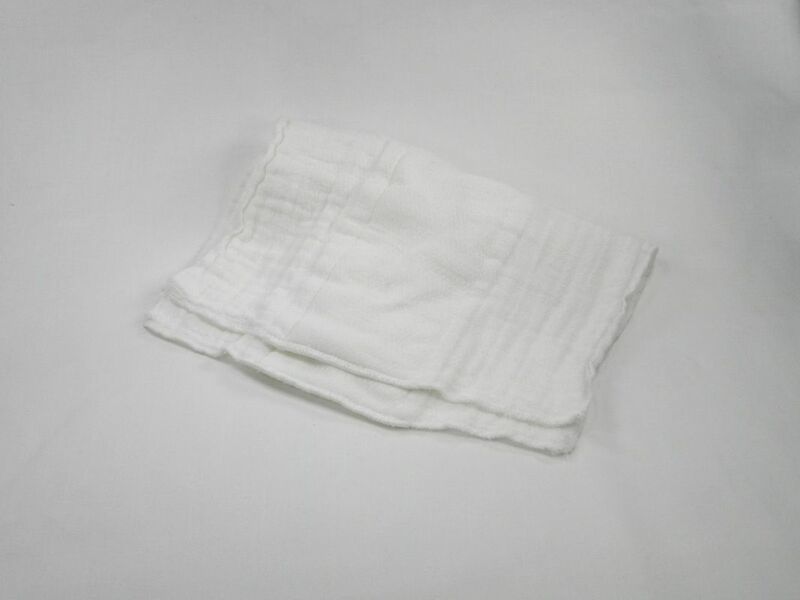 The criteria that we use to evaluate cotton rags are: 1) softness, 2) strength, 3) lack of fuzz, 4) durability, and 5) price. Since there is no need for overkill here we just use a Gerber Prefold Birdseye 3-Ply Cloth Diaper. They make great, strong rags that can be used for all sorts of things. You can buy these rags at Amazon or your local Babies”R”Us store. To organize all of the miscellaneous tools that we put in our range bag tools we use two of the same 7" x 10" Equinox Nylon Mesh Stuff Sacks that we use for camping. This keeps the tools, pens, and screwdrivers together so that we can easily find them when we need them. You can buy these mesh bags at Amazon.